A Review: There are a million books, television shows and speakers on real estate investing in general. Some offer up the latest get rich quick scheme, while others just sell their own materials. Some are very useful. But, good books on commercial real estate investing specifically are not as easy to find. 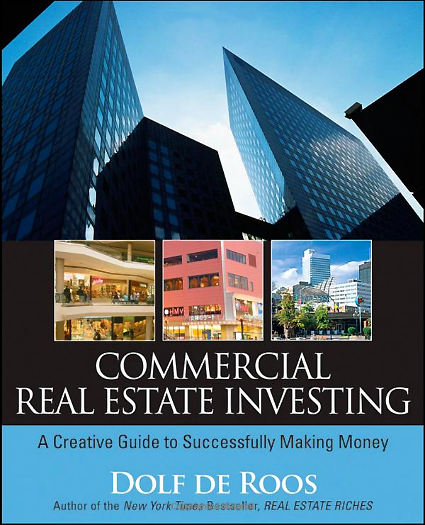 Dolf de Roos Commercial Real Estate Investing: A Creative Guide to Successfully Making Money, Published by Wiley in 2008, is a great resource. The author himself is a successful investor – rule number one when choosing books on real estate investing. He has been on the Wall Street Journal’s and the New York Times’ bestseller lists. His most famous book is “Real Estate Riches.” Visit de Roos’ website for more information at www.dolfderoos.com. It pays to invest in commercial real estate in particular. This topic is covered very well in the first four chapters of the book, as he talks about the myth that commercial real estate takes massive cash. He talks of some of the stabilizing factors of commercial investing like length of lease and less stringent laws about tenants. How to choose your investment. Chapters seven and eight have some very interesting and intriguing ideas about finding tenants and reasons to buy certain buildings. Some highlights are putting up a cell tower on your commercial property to add value or finding someone with a business that needs a location and buying a building for that business. Buying an empty building is cheaper and the value immediately rises when you put your new tenant in it. Financing is not impossible. The book is dated in the sense that it is speaking of the pre-2008 market. In the 2012 market money is harder to come by. However there is still private money around and owner financing that can be used. The financing section, chapter thirteen, is one of the most interesting in the book. “Financing Commercial Real Estate” covers “proposals for finance”, “property descriptions of collateral”, and all the other documentation needed to present a clear and coherent proposal to a lender or investor. Being creative gives you the advantage. The overall point of the book, the theme that runs throughout, is the flexible thinking needed and possible in commercial real estate. Mr. de Roos has some excellent examples of the flexible thinking necessary to buy and manage commercial real estate throughout the book. It is full of ideas and examples of flexibility. I found it an excellent and informative read. Also, it has clear examples of the possibilities and would be a great addition to your library of real estate investing books.